Wednesday through Saturday, noon to 9 P.M.; Sunday, noon to 5 P.M. It's not every day that you're invited to hold and even squeeze an expensive glass artwork. This is the first thing that happened when I recently met with Korean-born sculptor Eunsuh Choi to discuss the ideas behind her current work, which is on view at Nazareth College's Arts Center Gallery. "It looks fragile, but the architecture is very sturdy," Choi says, as she lifts a small piece from the pedestal and places it in my nervous hands. The piece is much lighter than I anticipated. "You can feel, by pushing it, how strong it is," she says, and I gently press on the sides of the sculpture. 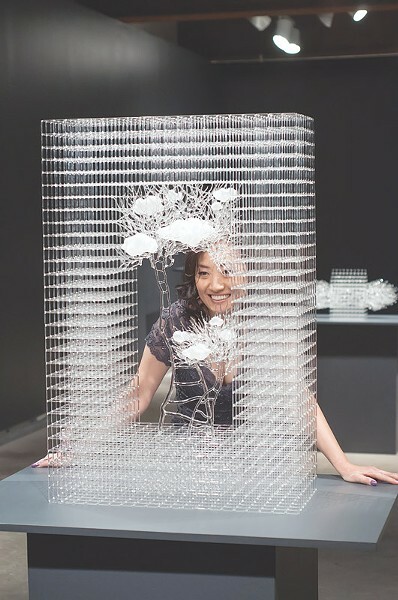 Eunsuh Choi with one of her intricate glass sculptures. She's right. 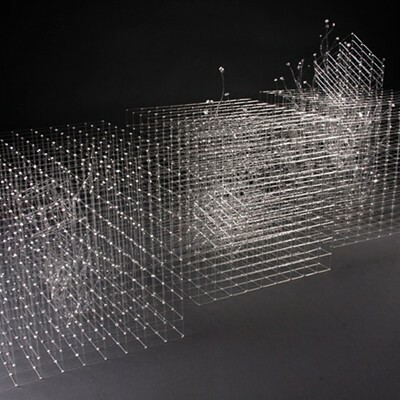 The work is made of hundreds of thread-like, clear Borosilicate glass rods, tediously flame-built into a structure made of countless cubes. It's incredibly delicate and surprisingly strong all at once. "I say it's like a woman," Choi says, laughing. About a dozen small- to medium-sized structures fill the gallery space, each a variation on the metaphor Choi has created about the universal struggle of personal ambition. "One of the characteristics that make the human experience such a unique one is that we all share a longing for personal enrichment," Choi explains in the provided artist statement. "The search for individual fulfillment is a deep-seated pursuit within all of us. No matter how significant or superficial one's ambition might be, it is the presence of aspiration that beckons us as humans to somehow claim or carve out our own understanding of ourselves within our lifetime." Each sculpture in the show explores this impulse through the metaphor of the box — symbolizing the physical, psychological, and emotional barriers we face — and the life within, struggling toward its goals — symbolized by the organic forms of flowering trees and twisting ladders, all reaching toward blown-glass clouds. "The tree becomes a metaphor for the self," Choi says. 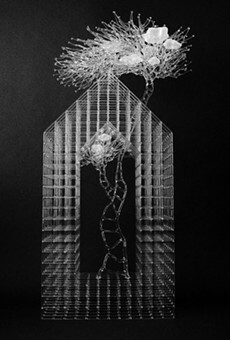 "I place the tree inside the box or house, a cage with triangular symmetrical shapes as the object that lives and breathes and has the capability of growing or dying. It represents my struggle inside the box of my existence when, as a foreigner and woman, I come across limitations on the attainment of my dreams. I am in the process of flameworking my way out of the box." The sturdiness of the seemingly fragile structures is a great metaphor for how the strength of a setback one person experiences can seem surmountable to those on the outside of the cage. And just as our own strengths may surprise us, they can also limit us. It is often the strength of our fears and doubts that holds us back, adding maze-like layers to the existing cultural barriers we face. These barriers manifest as familiar structures: houses, pyramids, or tall and narrow skyscrapers. The boxes are restricting, but the open, airy nature of the cubes gives the illusion of freedom, though the rods essentially form a cage. 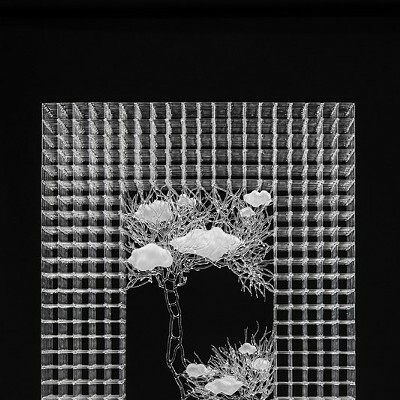 In "The Convergence of Barrier II," innumerable serpentine tree branches each terminate in buds, each pressing flowery faces against the open cubes' invisible constraints. This creates a sort of cheerleader tension in the viewer: why don't those blooms just come through the gaps? But life does find a way. Above, a mass of branches pushes at the top of the pyramid, lifting it. In other works, curious tendrils do wend outside of the cubes, as if testing the air. "Housed Barrier VI" is a vision of success. An interior ladder transforms into an exterior, mature tree, with clouds caught in its upper branches. 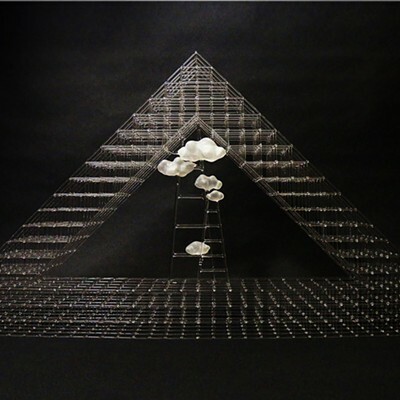 Choi's choice to work with clear glass for these pieces is also based in metaphor. The near invisible clarity of the material speaks about unforeseen barriers, about intangible dreams being difficult to locate, about losing our path and starting anew. In the triptych of cubes, "Double Conscious," interior trees bear seeds of more barriers, smaller stacks of boxes carried along the path of growth. The show's subtitle, "The Endless Journey," comes into play here. "There's never only one obstacle or limitation. There are a lot of things we have to break," Choi says. There is something simply poignant in the fact that the trees (symbolizing people), the ladders that they use to escape, the dreams, and the cages are all made of the same stuff. This points out our capacity to transform cages into tools by force of will and personal alchemy. As a fan of wordplay, I love that the clouds, symbolizing aspirations, are the only blown-glass elements of the work — requiring the maker to literally aspirate to create them. Amazingly, Choi creates these intricate works with no studio assistants, spending hundreds of hours on a single sculpture. The exhibit also includes a video that illustrates her process, and a slideshow of different sculptures, as well as breathtaking wearable sculptural items.